This past week I was on spring break from school, and I went to Shreveport, LA. with my daughter and grand-baby. They were looking for a house in which to live since my son-in-law was transferred there in his job. We saw some beautiful homes as well as beautiful country. The green grass was a foot high in places, and the pine trees and rolling hills were stunning. We saw lots of magnolia trees in the yards of the homes that we were viewing. The area was pleasant and interesting. The magnolia on my mind at the moment is our high school UIL competition cutting of Steel Magnolias by Robert Harling. We’ve been working on the production for a little over two months, and now it is time for our public performance. The students will present their play to the public tomorrow, Sunday, March 18th, at 1:30 p.m. They will host a fish fry lunch prior to the performance of the play. The luncheon will be from noon until 1:30. The director (me!) is a nervous wreck because the students have all been on spring break for a week, and we have not had a rehearsal or even given a thought to the play. I’m just hoping and praying that they haven’t forgotten everything we have learned. The six young ladies in the cast are, indeed, beautiful magnolias and steel ones at that. They have been the most congenial group of girls I’ve ever directed. There is no diva. The girls all have adversity in their lives, and they are all strong and intelligent young women. I’m proud to be involved in a small moment of their lives. Today, the junior English class at RSHS in central Texas finally got their blog, which will be the first blog presented from Richland Springs High School, up and running. I’m so proud of the juniors. They developed the site, wrote some articles, published a few articles, and managed to get excited about blogging. They did a fantastic job for a first effort. 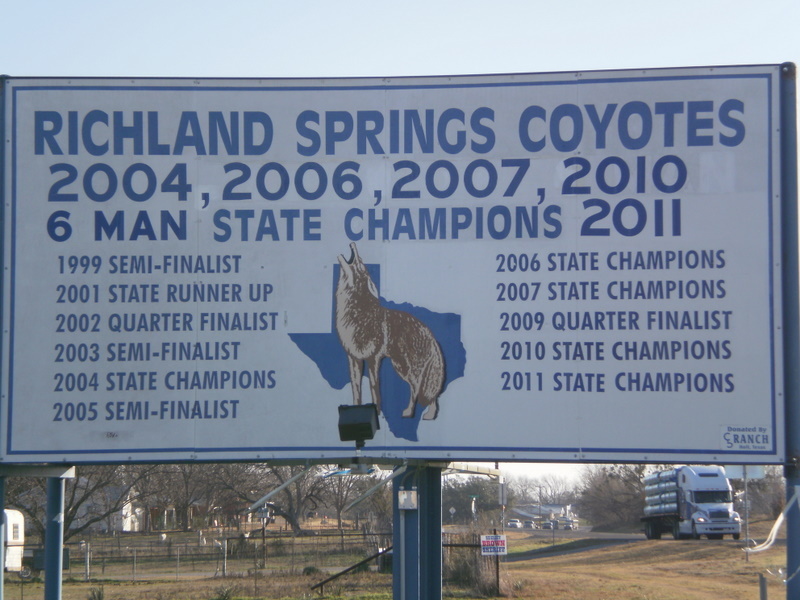 They actually took some photos of the two signs which proclaim our football team as 5-time, Division I, State 6-man football Champions, but we never could get them onto our blog during our seemingly very short class period. We will try again next week. You can visit our school blog at: https://www.rscoyotepride.wordpress.com. Last night I was most disappointed when theatre auditions for The Corn Is Green fell apart when we didn’t have enough young men show. This morning I made the executive decision to start all over. Now, we are planning to cast Steel Magnolias next Monday. I think the boys have “Six-Man State Champions Hangover”. They are still very tired from the many hours and days of preparation it takes to win a state championship. The boys started practicing a year ago this spring, and they started practicing seriously last August. They have been running, jumping, lifting, drawing, darting around, and kicking every day for many months. They know how much hard work it takes to be successful. Their coaches have worked nonstop and into the wee hours of the morning and on weekends. Coaches Burkhart, Rogers, and Brand are to be commended on understanding what it takes to have a state championship team and being willing to give those necessary hours. Those men are like a machine. They churn out victory after victory after victory. If you ever wanted to know how to teach, you should just go watch these guys in action. If you’ve never played 6-man football before, that does not matter to these guys. They will teach you, show you, help you. They take young men who have no clue about the game and the effort it takes to be a winner, and they turn those young men into winners and confident youngsters who feel like they can conquer the world. We are blessed to have coaches of this caliber in a town with a new population sign that reads: 336. It’s only 5:13 here, but the sun is already low in the sky and the shadows are long. A pair of cardinals are perched upon the water trough(my former bathtub while living in the original cabin) just out the back door. Mike, our cat, is patiently waiting by the back door and peering in the plate glass window and hoping that soon his supper will be delivered. On that note, I guess I should begin to consider what we will have for supper out here at the Mountain Pasture.